It’s been on my wish list for a while and it’s finally happened – I got myself a food dehydrator! 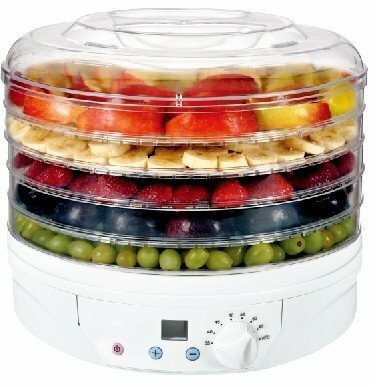 I did so much research in to this that I thought it would be useful to add in to this site so you if you’re looking for the best food dehydrator it might save you some time. Without any further ado, let’s take a look! Food dehydrators are fairly simple – they produce hot air and a fan distributes the air around the trays, drying what you have inside. What was important for me when looking for a dehydrator was that it was going to be something that would stand up to a lot of use and something that I could set going and forget about. So build quality was important and also having a timer. Most have the timer these days and if you’re around a lot you might not even find it’s an important feature for you. Definitely think about how often you think you’ll use your food dryer for. Is it going to be something that is an occasionally used thing or are you planning to do many things with it – perhaps preserving a harvest from your garden or allotment. This will determine what price range you’ll want to look at – if it’s going to be in use a lot then the cheapest items might crack and not be up to the job. 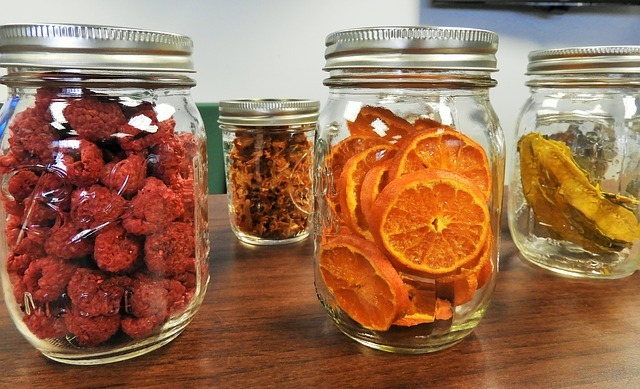 What can you use a food dehydrator for? All sorts! The most common use is for drying fruits and vegetable and if you have an allotment or fruit trees then I’d definitely recommend this so you can preserve your harvest. It’s also good for drying meat – especially for making things like beef jerky, biltong or even dog treats. Other uses include drying mushrooms and herbs and also making fruit leathers – a great snack for school or lunchboxes without the plastic wrapping! Ok, so it’s unlike me, but for once I decided to not just make do with the cheaper versions and go all our for the good brand. 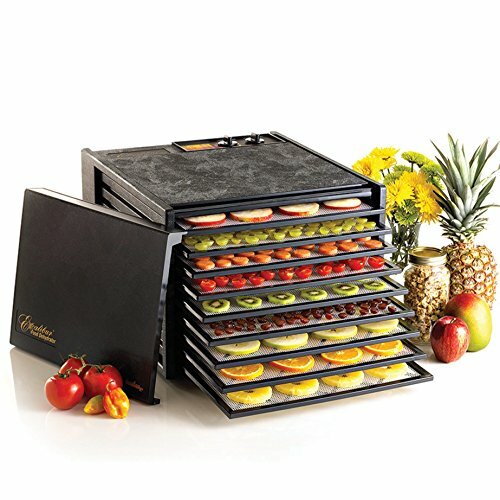 This is the one I ended up going for – the Excalibur food dehydrator. Literally one of the best food hydrators around – trust me. I did extensive research but also took into account the thoughts of my mum who has had one of these beauties for a few years now. Oh and I borrowed it for a bit to see if I liked it too so that helped. The Excalibur is used all round the world and is very popular in the USA and although it’s one of the more expensive brands out there, it really does last a long time and shouldn’t need replaced as often as perhaps the cheaper ones would if you used it extensively. It comes with 9 trays which should be plenty for your average home user – it equates to 15 square feet of drying space and what I really liked about it was the simplicity of it. It just works and it works well. It does take up a fair bit of space, but I think that’s fairly standard for dehydrators. Check out the size before you get it as I was quite surprised when I saw it in real life! This dehydrator from Andrew James is my number 2 choice and if your budget doesn’t stretch to the Excalibur then I’d seriously suggest this one. Price wise it’s at the top end of the budget machines and certainly at a range that would allow for dabbling in food dehydration without investing too much. I like the stackable trays in this model and the fact that they are easily cleaned, dishwasher safe and also you can vary the heights with it’s stacking system. The machine, like others in this price range are made of plastic and so have a much lighter feel to them but some might not like that. It’s also a lot smaller than the Excalibur so if space is an issue for you then this might suit you well. 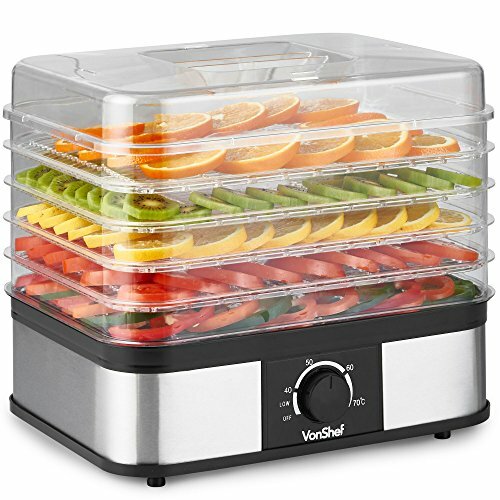 Another great option in the budget range of dehydrators is this one by VonShef who make quite a few kitchen appliances. I really like the look of this one and it’s something that I think you’d enjoy having out on your kitchen worktop as it’s so stylish. The stainless steel base really sets it all off and it will go with any kitchen. It’s fairly similar to the Andrew James version in that there’s some plastic trays that are removable – this one has 5 trays so slightly less drying room. It’s got fully adjustable thermostat but one thing this one doesn’t have is a timer which might be a deal breaker for some. Finally we come to one fo the cheapest food dehydrators around which doesn’t have a brand name on Amazon but does have a plethora of reviews so we can tell how well it performs. What this dehydrator has going for it is the price – it’s definitely something that you could pick up and see if you like dehydrating food or if it’s a gadget that will be relegated to the back of the cupboard. Perfect if you’re on a budget but still want to try it all out – it has many positive reviews also. 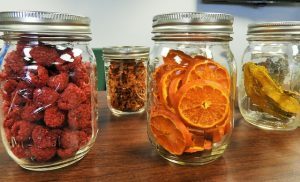 It’s fairly basic, but let’s face it, dehydrators are fairly simple and basic too so that’s not a huge downside. It’s white plastic with 5 clear plastic trays so does have a little bit of a cheap kitchen appliance look to it. It’s not too big though – about 12 inches in diameter (32cm) so should fit in a cupboard easily enough. Are bread makers worth it? Copyright © 2019 Busy Bakers. All rights reserved.